Unfortunately, too many Americans do not understand the significant contributions coal makes to the U.S. economy and our way of life. President Obama is taking advantage of this lack of understanding by waging a war on coal to the explicit benefit of his green pork agenda. His recent proposal to regulate carbon emissions from power plants, including those powered by coal, will have a devastating impact on the economies of several states, including Ohio. This regulation will produce a ripple effect across the entire nation by forcing people out of work, while increasing the price of electricity for consumers and businesses. Last year, President Obama’s Environmental Protection Agency (EPA) announced new source greenhouse gas emissions standards that, once enacted, will make it impossible to build a new coal-fired power plant in America, simply because the technology does not yet exist to meet the EPA’s regulations. This is hardly fair or affordable. In addition, the move represents a circumvention of Congress by regulating rather than legislating new public policy. According to Count on Coal, American coal provides 43% of U.S. electric power generation, providing power for more than 60 million homes and 3.4 million businesses. Direct and indirect employment generated by U.S. coal mining accounts for 555,270 jobs, for a combined annual payroll of $36.3 billion. In Ohio, coal provides 73% of the state’s electric power generation, which is the equivalent of more than 4.5 million homes and 200,000 businesses. Based on the cost of electricity, Ohio ranks #27 in the nation in energy affordability, according to the Energy Information Administration (EIA). 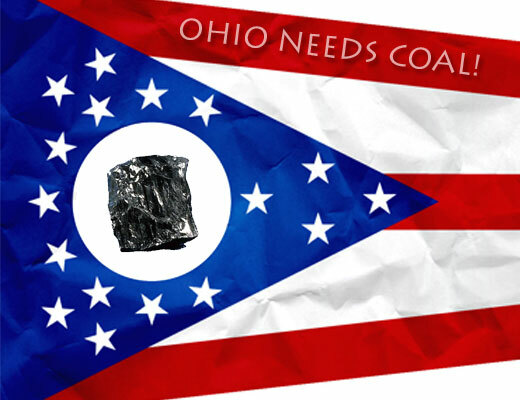 Ohio ranks #10 in the nation in coal production and #4 in the nation in coal use. Direct and indirect employment generated by U.S. coal mining in Ohio accounts for 27,540 jobs, for a combined annual payroll of $1.6 billion. President Obama has chosen a regulatory path to pursue his scorched earth green agenda, which will ensure that the hundreds of thousands of coal jobs in this country go up in smoke… but nothing else. The regulations proposed by his Administration will make it cost-prohibitive for the coal industry to survive, let alone thrive or expand. The impact of his proposed regulations could cripple too many Ohio communities whose workforces depend upon the coal community for jobs. In addition, the price of electricity we all pay will skyrocket. West Virginia Senator Joe Manchin and Kentucky Congressman Ed Whitfield understand the burdens that the Obama Administration’s proposed over-regulations would place on working families and electricity consumers. They have introduced legislation to combat these encroachments and allow for Congressional debate on this important economic issue. Their bill would eliminate the Obama administration’s proposed greenhouse gas emissions rules for new power plants and prevent emissions rules on existing power plants from going into effect until Congress passes legislation setting an implementation date. Additionally, the bill would require the EPA to set up different regulatory categories for natural gas- and coal-fired power plants. The battle for the future of coal is being waged on two fronts – regulatory in the EPA, and legislative on Capitol Hill. If President Obama and his allies have their way, there will be no future for coal. Period. This will impact our economy negatively in both the short and long terms. We count on coal for jobs. We count on coal to keep energy affordable. Ohio communities count on coal. Electricity consumers count on coal. We all count on coal. We need to realize what an integral part coal plays in our economy before it gets taken away.